Welcome to my Savage Model 1907 Pocket Pistol site. NOTE: If Internet Explorer displays a "content" warning, please click on the yellow bar and allow the content. There are active pull-down menus on this site that newer versions of IE can block. The first time I saw a Savage Model 1907 I had to have it. I mean, how many art-deco guns do you see? It was a cool little pistol that I knew nothing about, and I bought it on an impulse. Ten minutes after purchase, I took it to the local range. Even the "veterans" there had never heard of it. "Savage made a pistol?" was what they asked. I decided to do some research to see what I could find out about my Savage 1907 pistol. As it turns out, I was able to find quite a bit of information scattered about. For starters, I found the original patent (click on the Patent Info links in the green bar above) as well as a bunch of early 20th century advertising for the Savage Pocket Auto. In fact, I'll bet that I have the most extensive collection of advertisements for any single pistol, anywhere on the Internet. That's got to be worth the price of admission. 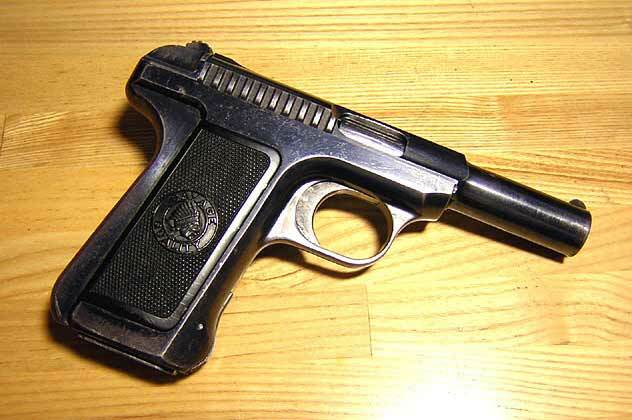 Click on the links in the green bar above to learn more about this interesting pocket pistol. Enjoy the site but please keep in mind that I'm not an expert, I do not buy or sell guns or parts, and I can't begin to put a value on your gun. To sell a gun, or to get an idea of what it's worth, go to the "Links" page and click on the link to one of the gun auction sites. If you feel an overwhelming need to contact me, go to the Links page, click on the link for The High Road forum and register. My user name there is EddieCoyle. You can then PM me. If you do contact me, please do so with the intention of forwarding me something I can put on this site; if not, at least thank me - this was a lot of work and it's not like I make money at this.